Looking for a dreamy escape? You’ll love this beach cottage’s original character and retro beach appeal. With enough space to accommodate two couples plus extra guests, it’s perfect for a family group or group of friends. 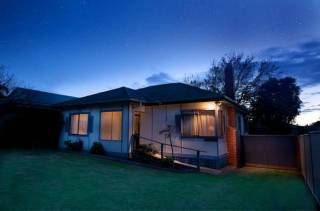 It sits just behind the beautiful beaches of McCrae and Dromana (10 minute drive) far from the maddening crowd and just a few kilometres from Red Hill and all the wineries and gourmet food producers. Just a perfect position for everything the Mornington Peninsula has to offer! The cottage has an open-plan dining/kitchen area and a separate second lounge. Sliding doors open to the gardens or deck, giving guests (and pets) freedom to flow from indoors to outdoors in summer. The cottage is air conditioned in all rooms and also comes with its own log fire to cosy up to in the lounge in winter. The cottage also has a TV, DVD player and WIFI. Completely secure for pets and an absolute haven for the kids. Relax and know they can't wander off. Couples after a romantic escape can also enjoy the outdoor deck for its privacy, water views and dining area with a BBQ. 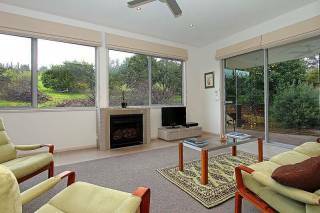 The cottage overlooks Port Phillip Bay, glimpses of which can be seen through the trees. Relax on the outdoor lounge with a drink and watch the sun go down over the Bay. This cottage accommodates up to 6 guests. There are two queen bedrooms and one bathroom with a shower and bath. The extra 2 guests can be accommodated in a sofa bed in the second lounge area, which can be closed off from the rest of the house. There is also a small nursery set up with a change table and room for a portacot (the portacot and highchair are supplied). Water in this property is from a rainwater tank only and consequently water pressure can be low. Combining the best of both worlds, hinterland and beach, the cottage is only six kilometres from the shops at Dromana and the beach and just five kilometres to Red Hill. Perfect for all the wineries and only minutes to the Enchanted Adventure Garden, Cloud Nine is the perfect retreat in both summer and winter. ALL BOOKINGS AND TARIFFS ARE SUBJECT TO CHANGE WITHOUT NOTICE. ALL BOOKINGS AND DEPOSITS RECEIVED ARE SUBJECT TO THE LANDLORDS’ APPROVAL AND RECEIPT OF DEPOSIT MONIES. ALL TARIFFS ARE INCLUSIVE OF A $50 BOOKING AND SERVICE FEE. Payments received will confirm you have read and agreed to these terms and conditions. Mastercard (a credit card fee applies). *If paying by BPAY a credit card will be requested to be held as a security during your stay. If you do not choose a payment plan then to confirm an accommodation booking, a deposit of 50% for the total accommodation or package is required. The booking will be confirmed via email on receipt of the deposit. Full and final payment for the holiday booking is required 30 days prior to the commencement of the holiday. If the outstanding balance has not been received by the 30th day prior to the booking commencement date, Ocean Blue Coastal Retreats reserve the right to cancel the booking without notice and the guest will forfeit the deposit. Ocean Blue Coastal Retreats reserves the right to pre-authorise your credit card prior to your arrival. You give us preauthorizathion to debit your credit card up to $1000.00 should we need to without notice to remedy any damages or repairs, replace missing household items, as a result of excess cleaning, the removal of garbage and debris from the property, to recover expenses as a result of excessive usage or as a result of breaches of the terms and conditions. In the event of an account being in default and being referred to an external party for collection the customer shall be liable for all resulting costs arising from the recovery, including commission which would be payable if the account is paid in full and legal costs including demand costs. All deposits and payments are not refundable. We are not required to provide a refund if you change your mind about the services you asked for. Ocean Blue Coastal Retreats strongly recommends that you obtain travel insurance and will not be held responsible for costs, loss of deposits and payments made or other fees incurred due to cancellations resulting from but not limited to acts of terrorism, act of God, war, strikes, theft, delay, cancellation, civil disorder, disaster, Government regulations or changes in itinerary or schedule or from any occurrences or conditions beyond its control. If you need to change your booking for any reason, given 30+ days notice you can however transfer your booking to new dates or transfer them to other nominated guests. (for Peak Season bookings, 60+ days notice is required). Cancellations within 30 days (60 days for Peak Bookings) require full payment of accommodation and services booked. If you have to cancel a booking we will attempt to resell the dates for you and if we are successful we will reimburse you your deposited funds less $99 cancellation fee. We will notify you via SMS as soon as the property is available on your day of arrival. This will be sometime before 2 or 3PM depending on the property. NO LATE CHECKOUTS ARE PERMITTED between 1st December to 31st January. LATE CHECKOUT up to 12 noon is at the discretion of the management and must be prearranged the night before departure and is dependent on other guests arrival that day but if agreed will not incur a charge. For checkouts after 2pm ,the property must be reserved from the previous night and therefore includes an additional nightly charge. Free data is available for reasonable usage up to 5GB per day. Usage is monitored and excess usage above your free allowance will be charged at the rate of $25 per 1GB. Please note - should the wifi not be available due to technical or service issues NO compensation will be given. Where properties have log fires, a fire starter pack can be purchased for an additional fee, which includes logs, kindling, paper and fire starters. Logs can also be purchased from the local service station if required. all rubbish removed from the property and placed into appropriate garbage bins provided. It may be a requirement to take rubbish bins out for collection if you are staying in the property on a collection day, check the collection day in the property compendium, failure to do so will incur $20 per bin fee which will be deducted from your bond. Pet Owners - please check gardens and pickup anything left by your pet. Pet owners - excessive cleaning of hair on furniture or bedding may also incur a cost. If any or all of these items are not attended to a minimum $75.00 or the additional cleaning time required to bring the property up to standard will be deducted from your credit card or be otherwise recoverable from you. A mobile phone number must be provided and be contactable when occupying the residence 24/7 for security purposes. NO SCHOOLIES BOOKINGS PERMITTED or bookings for groups under 25 years of age. Should not exceed the number stated on the Confirmation Notice or subsequently agreed in writing or email. Bookings will be made for the maximum number of guests you require to stay at the property at any time regardless of the number of days your additional guests choose to reside with you. We will not breakdown the cost of the bookings based on individual days for individual guests. NO DAY GUESTS ARE PERMITTED. Guests are at no time permitted to erect swimming pools, inflatable play equipment, shade tents, camping equipment, park caravans or such like on the property which will constitute grounds for re-entry, eviction and forfeiture of security bond. The accommodation is for registered guests only. Parties are not permitted under any circumstances and there is to be no noise audible between 10pm to 8am and no excessive noise at any other time. Evidence of parties/use as party venue the bond will be forfeited in full. A $100 deduction will be charged with each security or caretaker callout. If after one warning for noise and behaviour property manager or its respresentatives has reasonable grounds to believe that the property is being damaged, at risk or guests and visitors are in breach of the Terms and Conditions, the property manager has the right to inspect the property, vacate the property of guests and visitors and retain the security deposit. FURNITURE must note be moved from its original position to avoid damage. LOSS – the owners take no responsibility for your or your guests’ or invitees’ personal property during your stay or items left at properties on departure. It is recommended that all guests and visitors purchase travel insurance to protect against loss of belongings, cancellations, injury and death. Property managers will endeavour to describe the property and its position to the best of their ability and in good faith. We do not take any responsibility for incorrect descriptions or omissions and will not be held liable should the property not match your expectations. Two cars only are allowed per property and parking is permitted only in allocated parking bays. Please do not park on the nature strips. A full book of instructions is supplied in each property detailing how all the appliances work etc. 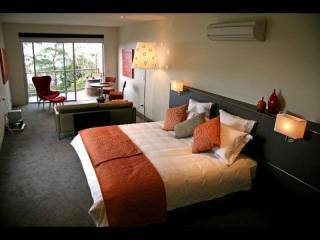 If you require a member of staff to assist with any problem during your stay a $100 attendance fee may be incurred if the problem is not a fault in appliances or utilities etc. Our gardening and maintenance staff may require access to the gardens and property during your stay, we ensure these visits are kept to a minimum but are sometimes unavoidable to ensure the high maintenance of the property. Should maintenance need to enter the property we will endeavour to give you as much notice as possible. Ocean Blue Coastal Retreats is strictly NO SMOKING indoors. Guests found smoking will be asked to leave and all additional cleaning and deodorizing costs will be charged. Any damage caused by smoking will also result in extra charges. Settings for any pool or spa are automated and any guest who tampers with the pool settings will lose their bond. In addition, please be mindful of Condition 7 above and we therefore ask you not to use the pool after 10pm and before 8am as a courtesy to our neighbours. Should the pool be unusable for up to 24 hours due to routine maintenance, no compensation will be given. We endeavour to ensure that maintenance disruptions are kept to a minimum. Never put any bubble bath, detergent, oils or dyes in the swimpsa as they stain the surface and clog the filters. The pool will be tested after you leave and any maintenance required will be deducted from your bond (average cost to drain and clean is $1000.00). Never allow pets into the pool and keep pets away from the pool area. Pets in a pool are equivalent to a large number of people (30 – 40) being in a pool. It will immediately affect the chlorine levels and make the pool unsafe to swim in. The water will become cloudy and pool maintenance and cleaning supplies will be necessary to rebalance the level. The pool may then not be available to you or following guests during a period of time. Compensation to following guests is costly and all expenses will be deducted from your bond. Do not allow pets on bedding and furniture. Do not lock pets inside while you are out. We do not take responsibility for pets left in courtyards or fenced gardens, you must do so at your own risk. Constant barking and/or howling is not acceptable. Complaints from nearby residents and guests will be referred directly to the owners, including the matter of refunds due to early departures. Please check the courtyards and garden areas thoroughly before you leave and clean up any messes left by your pets. Failure to do so will mean you incurring additional charges. Your pets are an extension of you. You will be charged for any damage at the property including damage done to plants, driveways, irrigation systems, hosepipes, outdoor furniture etc caused by your pets. Providing pet friendly property does not mean that your pets can cause damage and disruption to outdoor areas. We understand not all pets are created equal so if you are unsure about any of the above conditions please talk to us first if you have any hesitations, we can advise you on the type of gardens at our properties to ensure your pet is safe and the owners property is respected. In the event that the property is withdrawn by the property owner, Ocean Blue Coastal Retreats will endeavour to locate a property of equivalent specifications. However, should the alternative property be unavailable or unsuitable, the guest will receive a full refund. In the event of a problem or complaint you must inform Ocean Blue Coastal Retreats immediately so management has the opportunity to rectify the situation as quickly and efficiently as possible within reasonable time. Failure to follow this procedure may hinder the ability to rectify the problem or complaint and will extinguish any claim for compensation. By agreeing to these terms and conditions you acknowledge that if we are able to solve a problem within 24 hours then you are not due a refund.